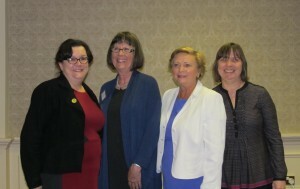 The recent Annual Conference of the Association of Lactation Consultants in Ireland was opened by Frances Fitzgerald, T.D., and Minister for Children & Youth Affairs, pictured here with (from left to right) ALCI President Margaret Murphy IBCLC, Keynote Speaker Barbara Wilson Clay, IBCLC, Minister Frances Fitzgerald and ALCI Vice President Meabh Anne McNamara IBCLC. In her opening address Minister Fitzgerald thanked the International Board Certified Lactation Consultants (IBCLCs) community for the work they do in supporting breastfeeding in Ireland. She highlighted the valuable contribution Lactation Consultants make to the health of the nation’s children. She cited in particular the emerging evidence from the Growing Up in Ireland Survey and the benefits of breastfeeding in combating childhood obesity. She encouraged IBCLCs (as strategic, key stakeholders) to become involved in government policy development, particularly in formulating the Early Childhood Strategy. With 10 plenary presentations and 3 workshops, over 2 days, plus research posters, networking, new product information and much more, the ALCI Annual Conference proved to be the premier event for health workers involved in assisting and promoting breastfeeding in Ireland. See Barbara Wilson Clay and ALCI President Margaret Murphy speaking on Ireland AM 3rd Oct 2013.